Find Evergreen, CO Homes for sale. View Photos, Maps and MLS Data Now! Singing River Estates - Located Just 15 Min. From I-70. MLS#8557248. Weichert Realtors Professionals. The Ridge At Hiwan - Enjoy quiet evenings on the deck w/ beautiful Mt views. Welcome Home MLS#9532672. COLDWELL BANKER RESIDENTIAL 28. This home has something for everyone: great location for any buyer, enough space for a family, lower level ready for extended family. MLS#5650385. KELLER WILLIAMS FOOTHILLS REALTY. Hiwan Estates & Fairways - Amazing mountain living with city conveniences. MLS#7687448. BERGEN PEAK REALTY. Tranquility and Harmony await you in this one of a kind, landmark, Evergreen property. MLS#8494346. COLDWELL BANKER RESIDENTIAL 28. Evergreen Highlands - Evergreen Meadows rec area is just a short walk down the street and includes fun for everyone with a pond, tennis courts, playground, stables and a barn that can be rented for events. You will love it MLS#2713803. Colorado Home Realty. Comfortable floor plan, immaculately kept updated 3/2 with live moss rock wood burning fireplace, refinished hardwood floors throughout, kitchen with granite countertops, newer windows, nostalgic wood paneled den with wet bar, large outdoor patio with SunSetter awning will take you back in time to a simpler lifestyle! MLS#5585634. LIV Sotheby's International Realty. Evergreen Highlands - Call office for features lists and inclusions. Too many to list! MLS#1945997. Mountain Metro Real Estate and Development, Inc.
New Anderson sliding doors to the deck. MLS#9187813. Simply Denver. 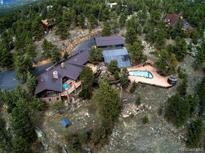 Upper Bear Creek - Whole house generator, sprinkler, ext. stained in 2018. MLS#4833664. LIV Sotheby's International Realty. The Trails At Hiwan - Walk/bike/golf cart to schools, rec center, 100+ acres of open space w/trails & Hiwan Golf Club (pool & tennis). This one shines! MLS#6136864. LIV Sotheby's International Realty. The Trails At Hiwan - Hot tub is in great working condition and is included. MLS#2870213. Keller Williams Foothills Realty, LLC. Extra Wide Garage. A Must See Home! MLS#8771694. COLDWELL BANKER RESIDENTIAL 28. The Trails At Hiwan - Make this special home your own or purchase as an investment ... currently rented to an wonderful tenant who loves the home and would like to stay! MLS#6670499. LIV Sotheby's International Realty. The Trails At Hiwan - 2 car plus garage. Fenced in yard with fountain. MLS#3385847. Redefy. In the main floor large laundry room, there is a cabinet that can be removed so a full sized refrigerator can be placed there. This is a must see! MLS#4141729. THE GOLDEN GROUP. The property adjoins a county park and has approximately 1,700' of creek frontage. MLS#3143523. KELLER WILLIAMS AVENUES REALTY. Come see this mountain retreat today! MLS#6670222. HomeSmart Cherry Creek. The Trails At Hiwan - New carpet throughout all bedrooms and expansive home entertainment basement. MLS#3366255. COLDWELL BANKER RESIDENTIAL 28. Brook Forest - *Livingroom and kitchen are open to each other*The living room offers cathedral ceilings and a wood burning fireplace*Kitchen includes stainless steel appliances and a gas range that are all included*Updated main floor full bathroom*Large master suite, that's updated bathroom with slate tile and large walk-in closet*The upstairs offers a large loft overlooking the living room on one side and on other side enjoy a jaw dropping mountain view*Sitting on almost 4 acres, this home has the most land for this price range within a mile radius*With all this land you get 2 outbuildings and a +/- 300 square foot south facing insulated greenhouse* MLS#2707022. Keller Williams Advantage Realty LLC. Hyland Hills - conveniently located between Denver and the slopes.... You won't want to miss out on this opportunity! MLS#5294540. Keller Williams Integrity Real Estate LLC. Be sure to check out the virtual tour! MLS#2394824. RE/MAX ALLIANCE. Wah Keeney Park - See the property brochure for a full list of updates. MLS#8292045. KPK REALTY LLC. Nestled on 3.72 acres, backing to open space and just minutes from town, this is truly an exceptional home. MLS#4285627. LIV Sotheby's International Realty. Evergreen Meadows - The third bay of the garage makes for a great workshop. Shown by appointment only. MLS#2313778. RE/MAX ALLIANCE.